The German Operations and Procedures Key (OPS) is used to encode operations and medical procedures in inpatient care as well as in outpatient surgery in the clinic. Together with the disease-related codes from the ICD-10 catalog as well as individual patient data, they represent the essential components for the evaluation of a flat rate (G-DRG) for every case. Click through the process steps and get comprehensive expert information on the subject of OPS / ICD-10. An ICD-10 or an OPS key is a code that allows documentation of a particular encryptable diagnostic or treatment option in the hospital, thus providing the basis for measurability. Some of the most important institutions that carry out the further development and evaluation of our healthcare system are the InEK, the DIMDI and the IQWiG. Our team of experts will gladly assist and advise you regarding your OPS / ICD-10 Applications. What is an OPS / ICD-10 application for? The use of OPS / ICD-10 codes by the service providers enables the determination of case numbers as well as the costs incurred by a procedure or diagnosis. These data are necessary for the adaptation of the DRG information, with regard to the relative weight points, the amount of costs in the cost center cost element matrix of the InEK as well as for length of stay limits among other things. If a new procedure is to be used which does not yet have an OPS code, this can be requested by means of an OPS proposal. The calculation of the costs incurred per treatment case with cost allocation to the respective cost centers takes place annually by the InEK. The confirmed cost and coding data is provided to the InEK by the assigned calculation hospitals. 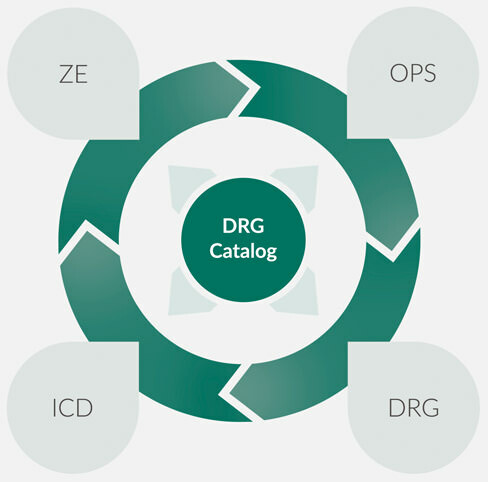 The need to integrate an OPS / ICD-10 code into the G-DRG system can be measured by the number of cases that have been reported. Therefore, it also affects the decision whether a coding is included in the allocation tables of a case lump sum. If insufficient case numbers or cost data are available or if the procedure can be directly assigned to an OPS code (this applies to accompanying or inclusive measures – for example wound closure after surgery), then the remuneration is scattered and included in overhead costs. A visible reimbursement can be made, for example, by influencing the assignment logic of a DRG via an OPS / ICD-10 or via an additional fee. However, the costs of providing each individual service are taken into account in each case. Who can submit OPS / ICD-10 applications to DIMDI? The proposals for the extension of the OPS / ICD-10 classifications or the so-called OPS / ICD-10 amendment proposals, must be submitted in consultation with at least one of the relevant professional associations in order to guarantee the technical quality of the applications. Since the claim year 2016 for 2017, the DIMDI has requested a written confirmation of the vote with the trade association or the professional society together with the OPS amendment proposal. Individuals and other institutions of the German health service can also submit proposals. However, they are asked to coordinate the relevant content in advance with trade associations, as otherwise the DIMDI has to initiate a coordination process, which would slow down the process. In some of these cases, applications can no longer be finalized during the current proposal procedure and acceptance can be delayed by one year. The application process window usually opens annually in early December. The deadline is always on the last day of the month of February of the following year (29.02. in case of a leap year). Applications for the further development of the ICD-10 classification are much rarer than the applications for the further development of the OPS catalog!